Please refer to our stock # Hasui097 when inquiring. Series. 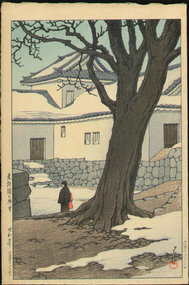 Selection of Views of the Totokaido Publisher: Watanabe Shozaburo. First edition. Bears the Watanabe C seal (sausage seal) used between 1929 and 1942. Kawase Hasui Japanese Woodblock Print - Senjo Plain, Nikko - 1st ed. Kawase Hasui Japanese Woodblock Print - Shiba Zojoji Temple 1st Ed. Kawase Hasui Japanese Woodblock Print - Cloudy Day at Mizuki First ed.